The urban myth that the Hilton Bayfront agreed to open its pool to the public as part of a land use deal is so pervasive even some hotel staffers believe it. It’s not true, but there are some public access points along the waterfront many San Diegans might not know about. This story is a part of The People’s Reporter, a feature where the public can submit questions, readers vote on which questions they want answered and VOSD investigates. The question: San Diego citizens used to be able to use the Hilton Bayfront’s pool without being guests at the hotel. Why has this changed? Wasn’t that the deal for the bridge? To submit your question or vote on our next topic, click here. It’s long been billed as a well-kept secret only the most plugged-in locals are privy to: The pool at the Hilton Bayfront Hotel is open to the public. And why might such a fancy, exclusive hotel be so kind and generous? Because, say those who pass along the secret, the Hilton was forced to open its pool to the public as part of a deal with the city’s former redevelopment agency, which funded a pedestrian bridge across Harbor Drive at Park Boulevard that connects to the hotel’s parking garage. In exchange for hotel guests’ easy bridge access to downtown, the hotel gave San Diegans access to its pool. Turns out, none of that is true. The pool at the Hilton Hotel is not, and never has been, open to the public. No public access deal like that was ever made. Officials at the Port of San Diego, which leases the land to the hotel, said they have heard the rumor, but that there is nothing in its lease with the hotel requiring public access to the pool. Civic San Diego, the city’s former redevelopment agency, said there’s nothing in its bridge project that requires public access at the Hilton. The California Coastal Commission, which regulates waterfront access along the state’s coastlines, said there was nothing in the Port’s permit for the hotel that required public access to the hotel pool. And a spokeswoman for Hilton said the pool is, and always has been, for hotel guests only. So to all the San Diegans who’ve been happily swimming there, armed with your little secret that you try not to share with too many locals so as not to attract crowds – you’ve just been an unwitting pool crasher. But don’t be ashamed. This particular urban legend was so pervasive even some Hilton hotel staffers believed it. Some staffers told us the land-use deal granting public pool access recently expired. Garcia said he’d be surprised to find out the whole thing is one big rumor. He said every week he gets locals coming in and asking about public access to the pool. Most of them cite some sort of deal with the city, he said. He’s not the only hotel employee to perpetuate the public pool rumor. Admission: In my younger days, I snuck into hotel pools and hot tubs. So much of San Diego’s beaches and bay fronts are occupied by touristy stuff, I thought I was justified in taking back some of that scenery for myself. But then I had kids and had to act more adult-y. In 2016, having heard from a friend about the secret Hilton public pool that’s especially good for parents with toddlers who can’t swim yet, I did the responsible thing and called ahead to make sure it was actually OK for my family to use the pool. The front desk receptionist confirmed we could come; when I asked why, she said it was required in the hotel’s lease. Flash forward a year: The next time my family and I wanted to swim, we were denied entry. A security guard told us the deal, once required in the hotel’s lease, had officially expired. I have tried to trace the root of this sticky urban legend. Online, it first seems to appear in a 2015 Tripadvisor review by a woman who warns her fellow paying guests of the public access. “As a Hilton Honors member, I expected to be treated as such, not as a member of a local YMCA. Disappointed!” she wrote. The rumor shows up again on Tripadvisor in a 2016 review. There might also be some confusion surrounding the resort pass, which allows locals to buy passes for several local hotel pools, including the Hilton in Mission Bay. 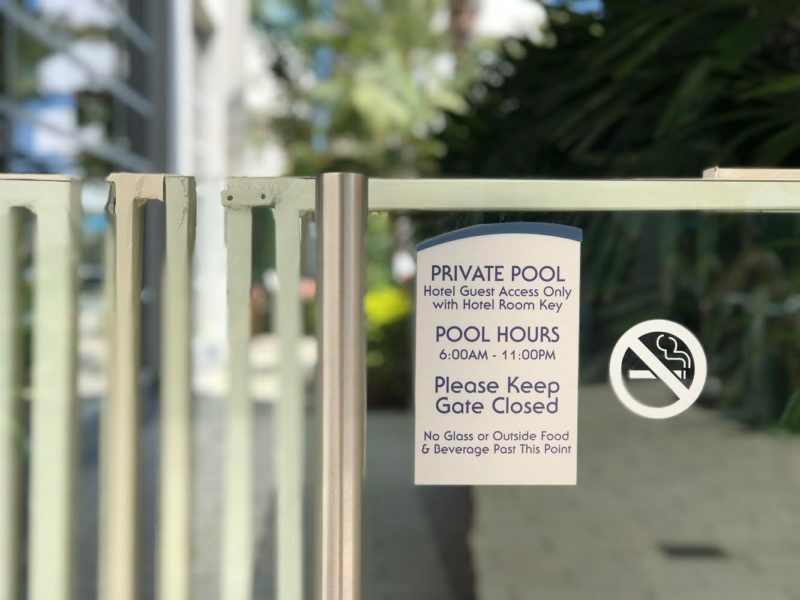 Some of the confusion could also be due to the fact that a few local hotels do allow members of the public to use their pools. Ultimately, though, this rumor appears to have spread because of the beauty at the base of it. Urban legends, folklore, myths, rumors – misinformation is most powerful when people really, really, really want it to be true. Imagine a San Diego in which locals could access all the waterfront property inhabited by tourists. Wouldn’t that be nice? There are, however, some public access points along the waterfront many San Diegans might not know about. One of the purposes of the Port of San Diego is to ensure the public’s right to access the San Diego Bay. Along with ensuring low-cost visitor and recreational facilities along the waterfront, the Port sometimes requires public walkways, view access and other amenities in its deals with tenants and developers. The USS Midway is required to provide free public access to a designated viewpoint at the western edge of the deck of the museum when it’s open. On Harbor Island, the Coasterra restaurant has a public walkway around the restaurant on its bayside. The SpringHill Suites on Lane Field near Broadway Pier has a fourth-floor deck that’s accessible to the public during business hours. There’s a public walkway between the Convention Center and the Marriott Marquis & Marina that provides a shortcut to the marina area. In America’s Cup Harbor, there’s a pathway on the water side that provides a shortcut to Shelter Island. The new Portside Pier (the site of the former Anthony’s restaurant), will include a second-floor public walkway and viewing deck with tables and benches offering panoramic views of San Diego Bay. It’ll also include a publicly accessible “dock and dine” dock that can accommodate up to four boats. Convention Center and Port officials are also working to possibly open six dormant tennis courts on top of the Convention Center to the public. This story came from an audience question. Submit your question below and we might answer it in a future People’s Reporter story.